How to request the exclusion from the additional duties? The US Trade Representative (USTR) determined to imposed additional duties on Chinese made products with an annual trade value of approximately another $200 billion. The tariffs will take affect on September 24 and will initially be set at a rate of 10%. That rate will jump to 25% on January 1, 2019. Our flooring products are on the list also. We are always doing whatever we can to try to help our customers to minimize the effect from the additional duty. USTR has issued the procedures to request the exclusion from the additional duties for the 279 tariff subheadings (additional duty effected on August 23, 2018) on Federal Register / Vol. 83, No. 181 / Tuesday, September 18, 2018 / Notices. We would like to share these information. This should be another opportunity for you to be exempted from the additional duties. We can refer to these details and prepare the documents in advance. 1. Who can submit the request? The US Stakeholders including importers, distributors, wholesalers, retailers and trade associations can submit the request. USTR must receive all requests to exclude a particular product with 117 days after the effective date of the additional duties. That means January 11 is the last day to submit the request for this $200 billion newly announced products. The earlier, the better. 3. How to submit the request? USTR strongly prefers electronic submissions made through the Federal eRulemaking Portal: http:// www.regulations.gov. Follow the instructions for submitting requests for exclusion. The docket number was USTR-2018-0032. This docket number may be updated for this $200 billion products newly announced. We will follow up. 4.1 Identification of the particular product in terms of the physical characteristics (e.g., dimensions, material composition, or other characteristics) that distinguish it from other products within the covered 8-digit subheading. 4.2 The 10-digit subheading of the HTSUS applicable to the particular product requested for exclusion. 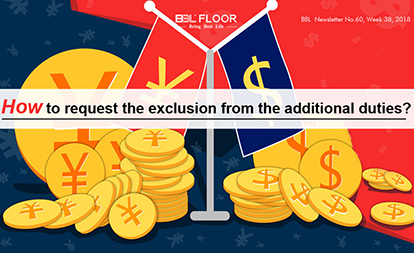 4.3 Requesters must provide the annual quantity and value of the Chinese-origin product that the requester purchased in each of the last three years. For trade association requesters, please provide such information based on your members’ data. If precise annual quantity and value information are not available, please provide an estimate and explain the basis for the estimation. 4.4 You will be required to answer the below questions. a, Whether the particular product is available only from China. In addressing this factor, requesters should address specifically whether the particular product and/or a comparable product is available from sources in the United States and/or in third countries. b, Whether the imposition of additional duties on the particular product would cause severe economic harm to the requester or other U.S. interests. c, Whether the particular product is strategically important or related to “Made in China 2025” or other Chinese industrial programs. 4.6 All submissions must include a statement that the submitter certifies that the information provided is complete and correct to the best of his or her knowledge. 5.1 File names for requests for exclusions must include the 10-digit subheading of the HTSUS applicable to the particular product and the name of the person or entity submitting the request. 5.2 If the request includes business confidential information, then two files must be submitted, the business confidential version and a public version. The file names must indicate the version, e.g., USTR-2018-0032-1234567890 Initech BC and USTR-2018-0032-1234567890 Initech P.
5.3 The submissions should be made in Microsoft Word (.doc) or searchable Adobe Acrobat (.pdf). 5.4 Please include any exhibits, annexes, or other attachments in the same file as the comment itself, rather than submitting them as separate files. 5.5 USTR prefers submissions made using the request form that will be posted on the USTR website under “Enforcement/Section 301 investigations” and on the www.regulations.gov docket in the “supporting documents” section and saved as a searchable Adobe Acrobat (.pdf) document. opposition and providing reasons for their view. the close of the 14 day response period, or 7 days after the posting of a response. All replies must clearly identify the specific responses being addressed. Any exclusion will be effective starting from the effective date of the additional duties, and extending for one year after the publication of the exclusion determination in the Federal Register. If granted, the exclusion will cover all the products imported under the same 10-digit subheading, no matter the stakeholders submit the request or not. Hope these information is helpful for you.